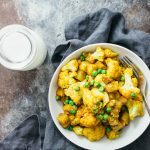 Cauliflower curry with potatoes is one of my favorite spicy dry curry meals: it’s a fast and easy one pan dinner with delicious Indian-inspired flavors. Heat cooking oil in a 3 quart saute pan over medium heat. Add the potato cubes, sautéing for a minute. Add the cauliflower and sauté for another minute. Then add the curry powder, cayenne powder, salt, and water. Stir well. Reduce the heat to medium-low. Cook covered with a lid until the cauliflower is soft and cooked through, about 10 minutes. Uncover the pan. Add peas. Turn the heat to medium-high. Cook and stir until the peas are cooked, about 2 minutes. The potato and cauliflower should look dry and nicely curried. Remove from heat. Squeeze lemon juice over the pan. Serve immediately.